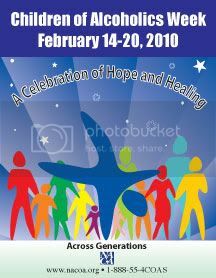 The week of Feb 14- 20, 2010 is being celebrated as the Children of Alcoholics week. Special emphasis is being placed nationwide on treatment and care for children with an alcoholic parent in their lives. Here is a link to the website of NACOA the National Association of Children of Alcoholics. It is filled with experience strength and hope for children with many real world programs to help them and those who comfort and support them. Check it out for information you can use in your daily life. Along those lines here is a link to SAMHSA’s guide for Community Action for Children of Alcoholics. It is a fact filled program of action, packed into a 41 page PDF. If you would like to help get the message of hope out to the children themselves here is a link to the NACOA brochure titled “It Feels so Bad” which speaks to the kids themselves letting them know it’s not their fault and that there is help available. You may print these out and distribute them to the kids yourself. Although this next pamphlet is designed for use by the clergy, it holds much information that any of us could use. It is titled “ Preventing and Addressing Alcohol and Drug Problems” and should be recommended reading for all parents and other caretakers of children.